Knock, knock, it’s about time for the 2018 BTO exercise! Buying a house is extremely daunting (trust us, we know) – there’s so much information everywhere. So we’ve scoured the Internet to combine the bits and pieces of fragmented information, to bring you the only article you’ll need to get a house! Sounds too good to be true? Sit tight and we’ll show you. If you’re all good on the finances and can’t wait to apply, jump directly to the flat application process down below. But if you’re still wondering whether or not you can actually afford getting a BTO – grab a notebook, a drink and get comfortable. Here’s a step-by-step guide to getting your dream house. First things first, are you eligible to buy a flat & take up a HDB loan? Once that’s done, you would have a pretty good idea of the types of housing available to you, and whether or not you’ll be able to take up a HDB loan. So, can you actually afford your dream house? Here’s how you can find out. We don’t mean to scare you, but you’ll probably be paying off this house for the next 25 years. Hence, it’s important to check your finances and know how much you’d be putting in every month. As excited as you are, getting your dream house isn’t as easy as shopping for a new pair of jeans. There are definitely a few things to take into consideration before purchasing your home. Step 1: How much does the house cost? Honestly, nobody knows for sure. You’ll only have a definite idea of the price during launch week. Anytime prior to that, you could always refer to the estimated costs of similar projects from the previous BTO exercises. Check out SRX – they do a pretty neat job bringing you estimated costs of upcoming BTO launches. 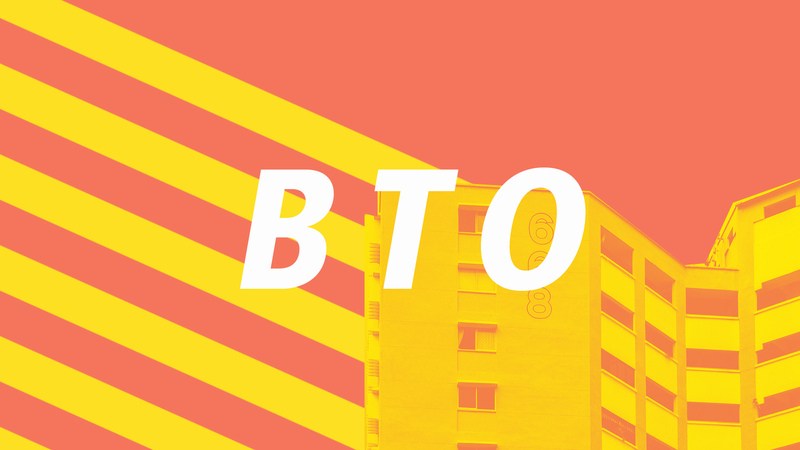 Scroll to the BTO launch prices to see the price estimates, take a lower estimate if you’re planning on getting a lower floor unit and higher estimate if you want a higher floor. Otherwise, the median price estimate should work for now. Step 2: Do you qualify for any grants? Additional CPF Housing Grant (AHG): $5,000 – $45,000 – if your combined household income is $5,000 or less. Special CPF Housing Grant (SHG): $5,000 – $40,000 – if you are getting a 4-room or smaller unit in a non-mature estate with a combined household income less than $8,500. We have a more detailed explanation and calculations of housing grants in this article. You can also get a calculation of your grant amount with this quiz. Step 3: How much money do you need to loan? Step 4: How much money can you loan? You already know the estimated cost of your dream house. But can you actually get enough home loan to cover the instalment? Note that the lower your income is, the less amount of money you will be entitled to borrowing. Use the Maximum Loan Calculator and input your employment details, income and other financial commitments (debts). The calculator will do its magic, giving you the maximum HDB Housing Loan (D) you can take and the estimated Monthly Instalment (F). The calculator factors in the Total Debt Servicing Ratio (60%) and Mortgage Servicing Ratio (30%) requirements while giving you the estimate of maximum loan. What is Total Debt Servicing Ratio (TDSR) and Mortgage Servicing Ratio (MSR) and how does it affect my home loan? Read here. The Maximum Loan Calculator is only applicable for HDB Housing Loans which allows you to take a loan value of up to 90% of the cost of the house. You’ll be required to submit a HDB Loan Eligibility (HLE) Letter when you attend the flat booking appointment with HDB. Your HLE letter is only valid for 6 months. 1st HLE will no longer be valid by the time of Key Collection since most BTO flats take 2-3 years to complete. You’ll be required to apply for a 2nd HLE. If your HLE application does not cover 90% of HDB purchase price at this stage, you are required to top up by CPF OA or cash. If you are unable to top up, you will have to either take up a bank loan or forfeit your flat and lose the 5% down payment you paid plus other initial costs. If you are taking a Bank Loan, you can take a loan value of up to 80% of your estimated cost of house. The terms of repayment period and interest rate will vary depending on your bank of choice. Before you ask – Yes. There is a difference between the HDB and Bank loan. Read more about HDB vs Bank Loan in this article and this article. Step 5: Can I afford my dream house? Step 6: How tough is my repayment going to be? Here’s where you’ll evaluate if the cash top-up is a comfortable sum from your monthly income. If you find the monthly cash top-up to be out of your reach, you might want to reconsider the choice of your dream house. If you’re all set – let’s dive right into the application process! After HDB drops the launch, you will have one week to submit the application through HDB’s website, or through a walk in at HDB Hub or HDB branches. Cost: $10 for application fee, payable by credit/debit card. Ballot results will come out 1.5 months after application period for BTO and 2.5 months for Sale of Balance Flats (SBF). You will receive an email of your ballot outcome. If successful, you will receive a queue number. Don’t worry if your queue number is higher than the number of units available, it might still reach your turn! This is because of the high drop-out rate during the flat selection process. You will be invited for an appointment to book a flat but your waiting time would greatly vary depending on your queue number. During which, check out the HDB page to observe the flat available for selection. It is also a good time to take note of your preferred units and study the floor plans. Be prepared for an excruciating process of watching your favourite units slowly become unavailable (it’s gonna hurt). If you are applying for a SBF and the flats are completed, you might want to do a site visit to see which units are your preferred ones. Cancellation: If you choose to cancel your flat application as this juncture, you will not suffer any financial forfeiture but would have considered as having rejected a flat once. If you reject 2 chances to select a flat, your first-timer priority will be suspended for a year. Any additional chances accumulated from your previous unsuccessful applications will be set to 0. You will chope your choice of unit during this appointment. If you intend to take a HDB loan, you will need to apply for HLE Letter and submit during the appointment. See the full list of documents required here. If you’re eligible for CPF housing grants, download the relevant grant application forms and submit during your flat booking appointment. You should also bring along the income documents to support the application. More information on grant application here. After booking, you will sign an Agreement for Lease within 4 months’ time. Cost: Option fee of $500 – $2,000 depending on the size of flat. This is only payable by cash. This fee is part of your downpayment and not an additional expense. 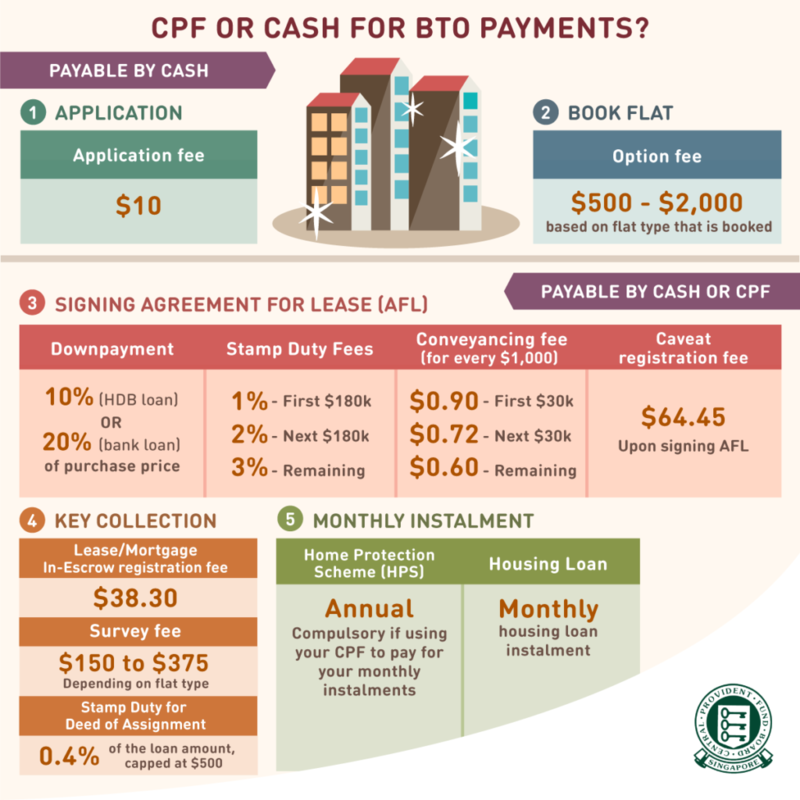 The option fee will be reimbursed to you in cash if there are enough savings in your CPF account to pay the downpayment for HDB loan applicants. If not, the option fee simply goes towards the cash portion of the downpayment. Cancellation: If you choose to cancel your flat application at this juncture, you will forfeit your Option Fee and barred from application for a year from the date of cancellation. (i) Downpayment: If you’re taking HDB loan, you’ll pay 10% of the flat price, you can use your CPF Ordinary Account savings (including the CPF Housing Grant). If you’re taking a bank loan, you will need to pay at least 20% of the purchase price as a downpayment. At least 5% of that downpayment must be paid in CASH. You can use your CPF OA or CPF Housing Grant to offset the remaining 15% of your downpayment. If you are eligible for Staggered Downpayment Scheme and financing under HDB loan, you’ll only pay 5% of flat price using CPF or cash. If you are taking a bank loan, you’ll have to pay 5% of flat price in cash and another 5% using CPF or cash (if CPF OA balance is insufficient). The remaining half of the downpayment will only be due upon Key Collection date. – 60 cents per $1,000 for the remaining amount. The Caveat Registration Fee of $64.45 (inclusive of GST) is payable when you sign the Agreement for Lease. All above costs are payable by CPF. Cancellation: If you choose to cancel your flat application at this junction, you will forfeit 5% of the flat purchase price (ouch!) and barred from application for a year from the date of cancellation. (iv) Stamp Duty on Deed of Assignment (for bank loans only): 0.4% of the bank loan amount, capped at $500. All above costs are payable by CPF. If you intend to use your CPF savings to pay your monthly housing loan instalments, you have to be insured under the Home Protection Scheme. It is a compulsory insurance scheme if you are using your CPF to finance the home loan repayment. The annual premium is automatically deducted from your CPF OA. You can calculate how much your premium costs here. Phew, and you’re done! We know it’s quite an overwhelming article – but hey, at least you didn’t have to scramble online to read from multiple pages. Our advice to you is to go through the article once more, to ensure that you’ve understood all there is to understand, and also to ensure that you’ve done all the calculations as accurately as possible. Otherwise, you’re a step closer to getting that dream house! Now all there is to do, is have this article bookmarked and opened in your browser, as you wait patiently for HDB to drop the launch. Good luck!